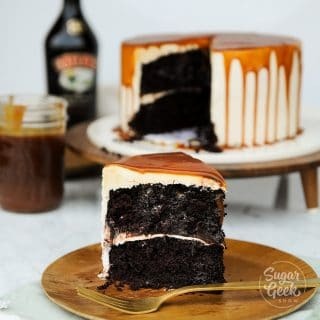 Chocolate Irish Cream Cake starts with my death by chocolate cake and you drizzle on a rich and creamy sauce made from Bailey's Irish Cream Liqour and finish with Bailey's Irish Cream white chocolate ganache! This recipe makes two 8"x2" cakes or three 6"x2" cakes. In a large measuring cup combine the stout, espresso powder and vanilla. Whisk together and set aside. Sift together the flour, cocoa, salt, baking powder and baking soda in a large bowl and set aside. Place softened butter in the bowl of a stand mixer with the paddle attachment. Cream until smooth and shiny. With mixer on low, gradually sprinkle in the sugar. Beat until mixture is fluffy and almost white. About 3-5 minutes. Add your eggs one at a time. Let the egg incorporate fully before adding in the next egg to avoid breaking your batter. Add in your mayo and mix until combined. With the mixer on low, add in 1/3 of your dry ingredients and mix until almost combined. Add in 1/3 of your liquid ingredients. Repeat the process two more times until everything is combined. Gently fold in the mini chocolate chips and divide equally into two 8" cake pans. Bake for 30 - 40 minutes until a toothpick comes out cleanly but with a few sticky crumbs. Don't over bake. Let cool and then wrap in plastic wrap and chill until the cakes are firm enough to handle. You can flash chill in the freezer if you need to cool them quickly. In a microwave safe bowl, combine the sweetened condensed milk and Bailey's Irish Cream. Microwave until almost boiling. Pour heated mixture over the chocolate chips and let sit for 2 minutes to let the chocolate melt. Mix until combined. In a microwave safe bowl, combine the heavy whipping cream and Bailey's Irish Cream. Microwave until almost boiling.